Join us on March 30th for our 2nd member led workshop of 2019. Betsy will be teaching a Beginning Ruler class. Want to explore quilting with rulers but are nervous about where to start? Betsy will share the basics of quilting with rulers and provide instruction on how to translate the use of rulers to different projects. We will be using the ruler to learn how to outline letters, words, or simple shapes by filling in the space around them. Reuse – Recycle- Repurpose: In this workshop, Kathy will teach you how to repurpose a men’s dress shirt into a quick, fashionable, fun and functional apron. Join us on January 26th for our first workshop of 2019 led by our very own Melanie and Amy. Melanie will be teaching Creative Walking Foot: You don’t need to be a free motion master to make beautiful designs and texture on your quilts– you just need your walking foot and a little creativity! We’ll explore techniques to create both planned and improvised angles and waves, then make mini quilts that can be used for placemats or pillows. Along the way, we’ll discuss technique and strategy for applying these techniques to bigger projects. 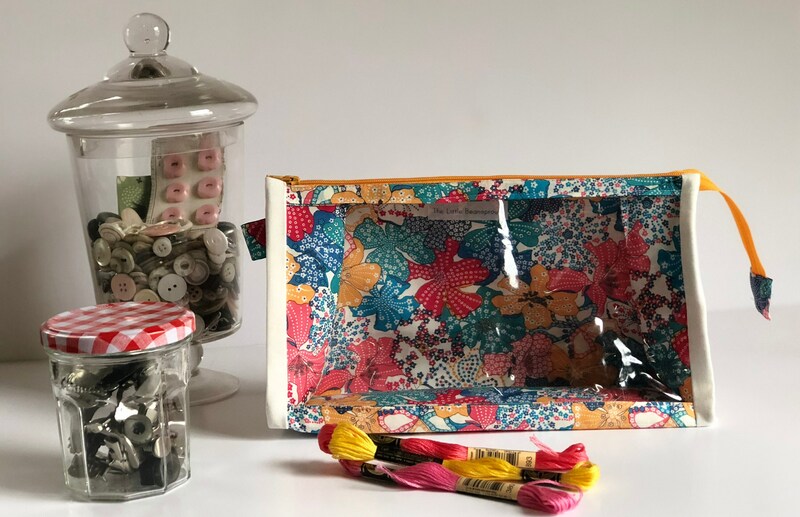 Amy will be teaching the Clear Boxy Pouch by Aneela Hoey: You will learn tips for working with vinyl and zippers. The Boxy Clear Pouch has a see through front pouch so you are able to view contents at a glance. The bag has a sturdy box shaped base with spacious interior.